In 1947 Heinz Keijser (Gronau 1911-Amsterdam 1988) bought an antique silver rattle. 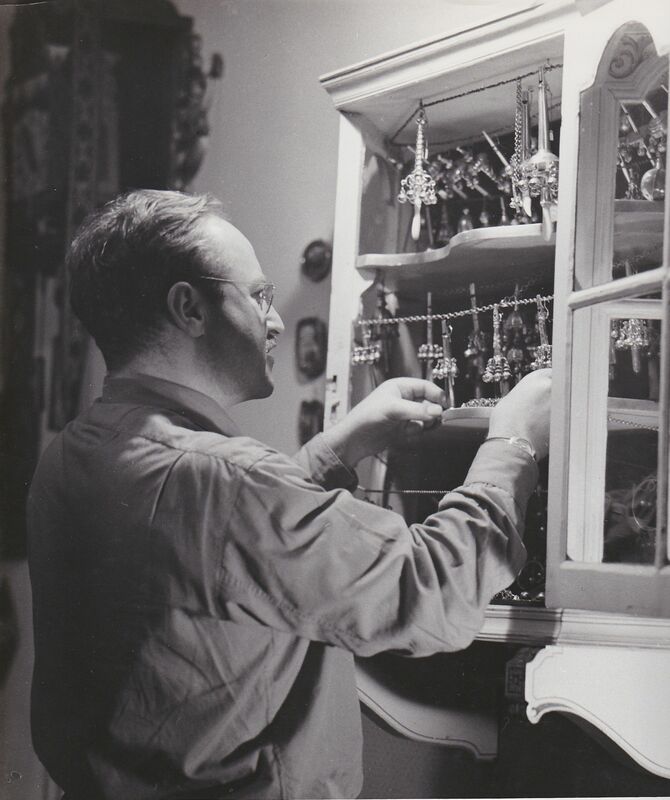 This purchase would be the start of his collection of ring bells and rattles which he developed in the following decades into one of the largest private collections in this area. Keijsers house on the Prinsengracht 21 in Amsterdam was filled with display cases with rattles, art, antiques, curiosities and books on this subject. Through the years, Keijser collected hundreds of rattles, from silver and gold variants to exotic types from all times and cultures. His collection became known within a circle of experts and fellow collectors. For years he maintained friendship with Ides Cammaert, whose collection is nowadays in the Bibliotheca Wittockania in Sint Pieters Woluwe. A second befriended collector was Marcia Hersey, author of the identification and appreciation guide "Collecting Baby Rattles and Teethers" from 1998, which she dedicated to her friends and co-collectors Keijser and Cammaert. With the exhibition "Rinkelbel en Rammelaar” which opened in the Amsterdam museum Willet Holthuysen on 19 June 1958, an important part of the Keijser collection of approx. 200 pieces was shown to a larger audience for the first time. Keijsers original copy of the catalogue has been preserved, with signatures of the attendees on the opening and references to the inventory numbers from the Keijser Collection. Parts of the Keijser collection were also exhibited in an exhibition about Dutch silver at the Institut Néerlandais in Paris in 1962, in the Singer Museum in Laren in 1973 and after his death in the exhibition "Kinderen van alle tijden" in the Noordbrabants Museum in 's-Hertogenbosch from 28 March to 6 July 1997. In the catalogue several rattles from the collection were included, which were then already housed in the Keijser Foundation. More recently, in 2015 a small selection of rattles from the Keijser collection was on display in the exhibition 'Baby Goods' in Streekmuseum Krimpenerwaard. Heinz Keijser died on February 14, 1988 and was buried at the Cemetery of the Amsterdam Liberal Jewish Congregation, Gan Shalom in Hoofddorp. With the help of the Keijser Foundation his gravestone was embellished with a pomegranate ornament, an old (Jewish) symbol which fulfilled an important role in his research into the meaning and symbolism of his collection of rattles. In addition to his collection, the Keijser Foundation houses H. Keizers extensive archive, which includes an autobiographical document from c. 1964. A concise Dutch summary of his biography is available via the download on this page.